As an option, the mason jars can be put in the freezer about an hour before making the Shirley Temple. Just before adding the ingredients to the jars, add about 2 tablespoons of granulated sugar to a shallow bowl, turn the jars upside down, and twist the rim of the jars in the sugar. Cut the limes into quarters. Add about 6 maraschino cherries in each Mason jar (or tall glass). Fill the Mason jars about three quarters full with ice cubes. Slide the wedges of lime in between the ice cubes and the inside of the glass jar so that it looks colorful from the outside of the glass. Add about 3 more maraschino cherries wherever there is room in between the ice cubes. Add the key lime twist soda leaving about 2 inches of space at the top of the jar. Next add 2 teaspoons of liquid from the jar of maraschino cherries to each Mason jar. Add the grenadine syrup and stir. Add more ice until it reaches the top of the jar. 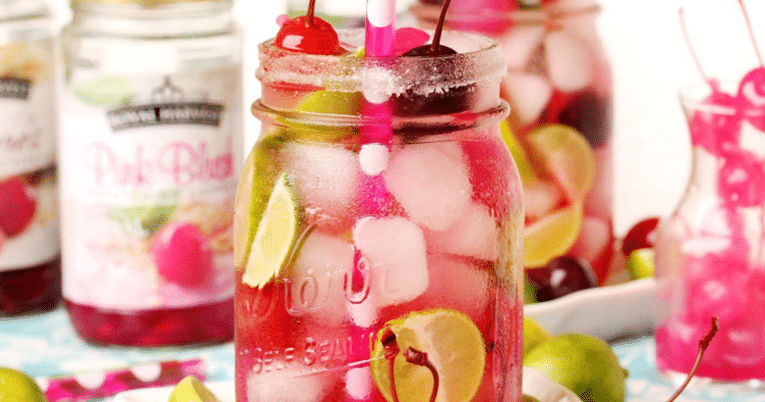 Top with a couple more cherries and lime wedges.